The countdown hand signals are hand signals where riders indicate how many riders are in their group by holding up the corresponding number of fingers. Riders signal a countdown of the number of machines in their group until the “last in line” (closed fist) signal is given. 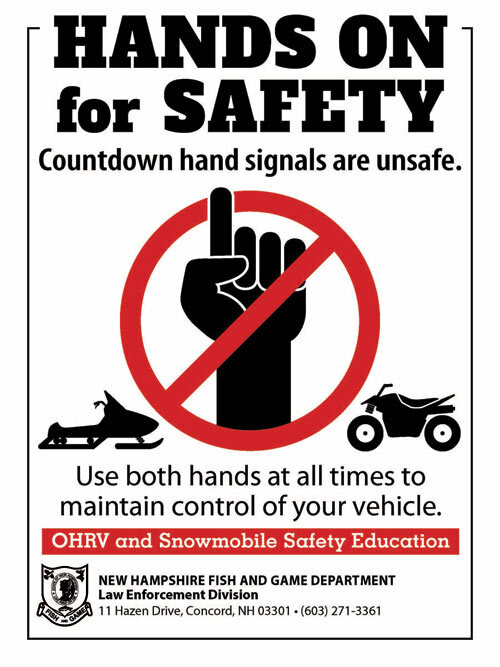 Although the countdown method of hand signals has been used and even taught for years, New Hampshire Fish and Game’s Law Enforcement Division strongly urges all riders not to use them. The reason is twofold. First, use of these signals requires everyone in the group to ride with one hand on their handlebars, lessening the rider’s ability to control their machines. Secondly, these hand signals give riders a false sense of what is coming on the trail. No one knows how many machines are really coming up behind them. All too often riders will hold up a fist to indicate they are the last rider in the group only to have another group right behind them. 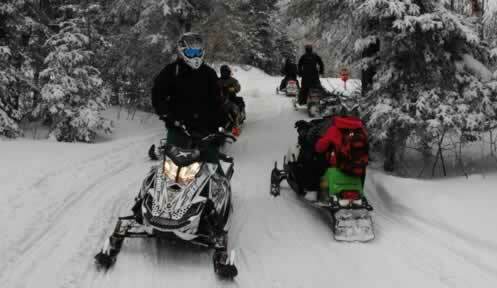 Always anticipate other riders on the trail and around the next bend. Keep both hands on the handlebars and maintain control at all times. the lead and at the end. Less experienced or younger riders should be placed in the middle of the group. My Side is the Right Side - stay to the right side of the trail and maintain a safe following distance with the machine in front of you. Please keep your HANDS ON FOR SAFETY!